The PTMSC's Future of Oceans lecture series, started in 2014, explores the frontiers of ocean research and emerging technologies while confronting the human capacity to understand and sustain healthy oceans. Each year hundreds of attendees are challenged and informed with thought-provoking presentations. To view the 2017-18 schedule of lectures, visit https://ptmsc.org/programs/learn/lecture-series. Marine acoustic researcher and citizen scientist Dave Bonnett will present the most recent findings of his work with Amazonian pink river dolphins (Inia geoffrensis) at the first of the Port Townsend Marine Science Center's 2017-18 lecture series, "The Future of Oceans," at the chapel at Fort Worden State Park on Sunday, October 8, at 3:00 p.m.
Bonnett, a PTMSC supporter since its inception 35 years ago, is experienced in the field of underwater acoustical research. He has undertaken numerous trips into the Peruvian Amazon with his wife Dottie, a marine biologist, to record and study the particular sounds of pink river dolphins and learn how ecosystem changes are impacting the species. "Our main objective in the beginning was to investigate the efficacy of using underwater sound recordings, along with behavioral observations, to identify and count individuals," Bonnett said. "We have discovered a very complex world associated with Inia, and are continuing to evolve and expand our research." Bonnett's lecture will also focus on how his research relates to local species of Cetacea in the Salish Sea. "There is a growing urgency to better understand this threatened species because of increasing anthropogenic pressures on both Inia and their habitat," Bonnett said. "This is a story that will be familiar to citizens of the Salish Sea." For the latest information about the Port Townsend Marine Science Center, visit www.ptmsc.org and www.facebook.com/PortTownsendMarineScienceCenter. Also, look for #PTMSC, #SalishSea or @PTMarineScience on Twitter and Instagram. 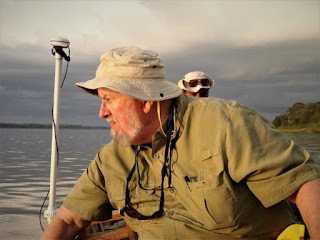 Mr Bonnett will present his most recent finding of his acoustical research with Amazonian Pink Dolphin (Inia geoffrensis) including how ecosystem changes in the Amazon are impacting this species and how this research relates to our local species of Cetacea. His research grows from decades of underwater acoustical research and designing ultra-quiet vessels. This is the first installment of The Future of Oceans lecture series. This event is offered with generous support by the Darrow Family.